← So much to say, so much to show and so little time to Christmas! – Speed Post 2 – Superb stocking fillers for under a fiver! 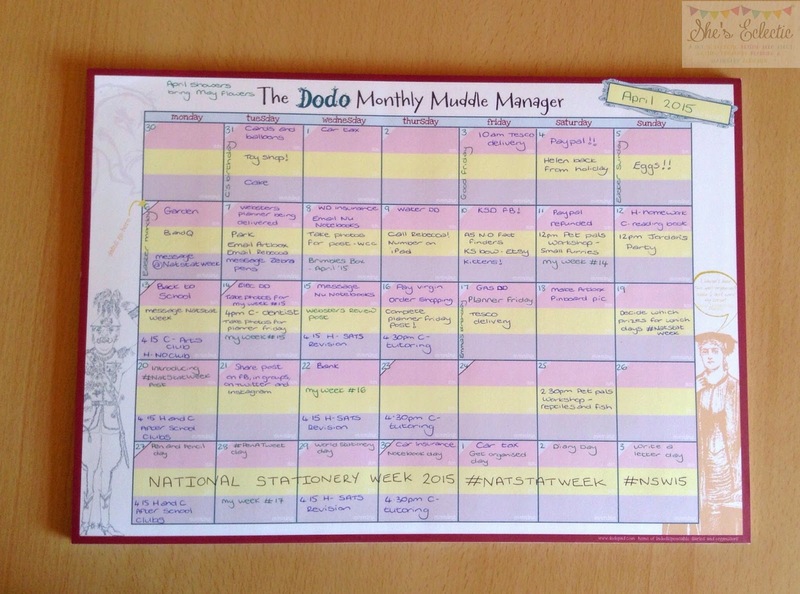 Get organised day – The Dodo Monthly Muddle Manager review and giveaway! We just SO loved this blog post today on ‘Get Organised Day’ in National Stationery Week, by stationery lover, Amanda Carter at http://amanda-sheseclectic.blogspot.co.uk/ we asked if we could reblog it here! If you want to enter Amanda’s competition please leave a comment on her original post rather than here! 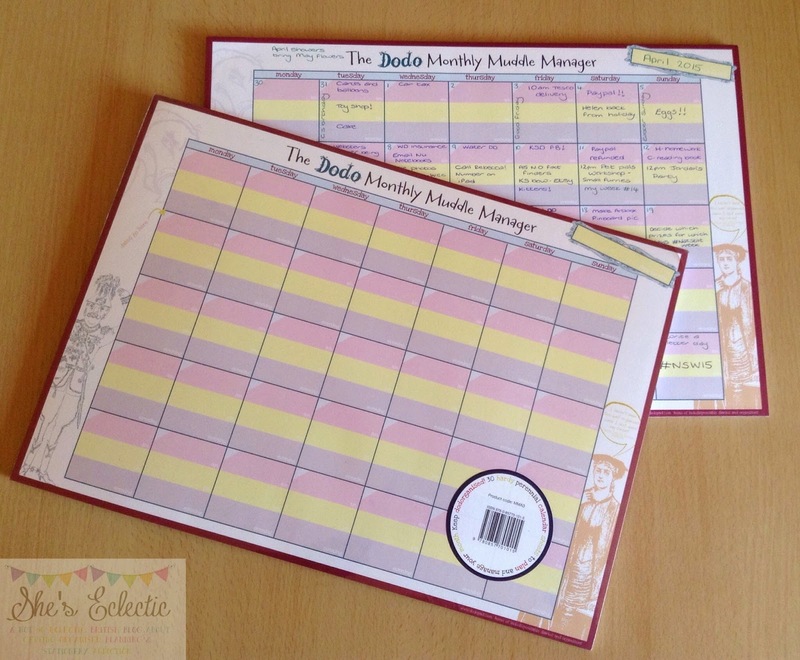 Today is Get Organised Day and the fab people at Dodo Pad have given me one of their new Monthly Muddle Manager pads to review and an extra one for me to give away to you! First of all I have to say “Monthly Muddle Manager” rolls off of the tongue nicely, as I have said before I love a bit of alliteration! “What is the Monthly Muddle Manager?” I hear you ask. Well it is a large, A3 size pad for your desk that has an undated calendar printed on each page. You choose which month you want to start with and fill in the date boxes (Can you call triangles boxes? I mean, I am, but I’m not sure it’s the right word?) and write the month in the top right corner. Each day has three sections for AM, PM and Evening so you can easily see what you have scheduled and which part of the day it is on. There are some Dodo Pad style illustrations around the outside edges to make it more interesting and some blank spaces to add your own doodles, random thoughts or phone numbers too. 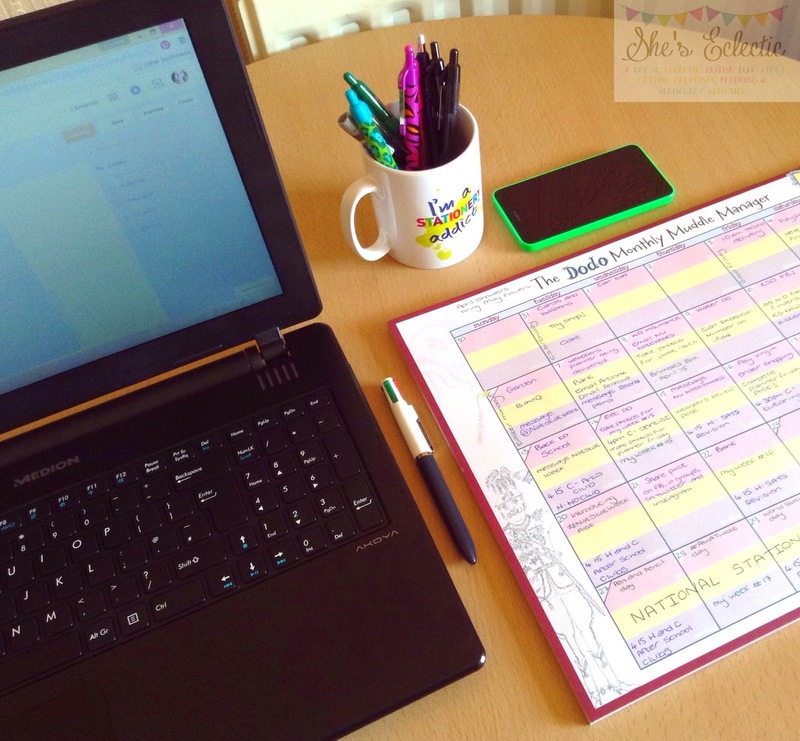 The Monthly Muddle Manager (sorry, I just like saying it!) is made from thick card so it is durable and hard wearing and has 30 calendar pages per pad so it will last you two and a half years! “Oh yeah but bottom of the page will get all crumpled and the corners will curl up and look a mess!” I imagine some of you are thinking but no, no they wont because the people who make it are very, very clever! They thought that could happen too so they came up with a smart idea, they glued the pages together at the bottom of the pad instead of the top so no matter how much you use it and write on it you wont “worry” or rumple the sheets. Glued on the bottom – what a great idea! I really like being able to see my whole month at once without having to open my Filofax and flip through to the right section. If I am on the phone and need to check a date or make a note of something it is right next to me and I can jot it down or scribble in the margin if it’s a long call and I’m getting bored. The size also means I wont knock it off my desk or miss place it like I have done before with smaller pads! 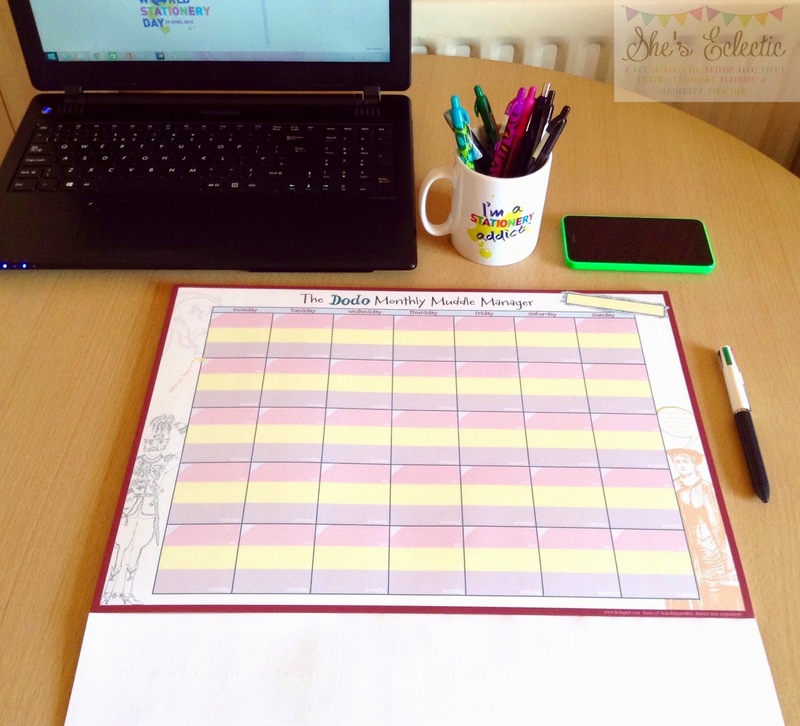 If you would like to win your own Monthly Muddle Manager all you have to do is comment below telling me what year the first Dodo Pad diary was made, you can find the answer here. I will number all the comments and then use random.org to pick a winner. Leave a comment telling me what year the first Dodo Pad diary was made – one entry per person please. The giveaway ends at 12pm UK time on the 10th May 2015 – entries after this time will not be added to the draw. The winner must contact me within 7 days to claim their prize or I will have to draw a new winner. Dodo Pad are another of the official sponsors of National Stationery Week so if you would like to support them please give their Facebook page a like and follow them on Twitter too. When I was a teacher, I used something like this, but this one is much better. 1966 – year of my birth that’s why I so into planning and quirky pretty stationary.